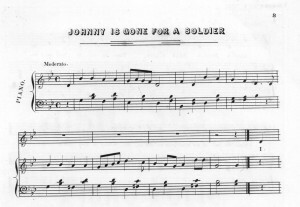 Johnny Is Gone for a Soldier. (1862) Sep. Winner, Philadelphia. [Notated Music] Retrieved from the Library of Congress, https://www.loc.gov/item/ihas.200001462. The journey of Irish songs now woven into the collections of traditional American music represents the journeys of the Irish people and how music and a war intertwined to bring the Irish immigrants into a more positive light in 19th Century America.